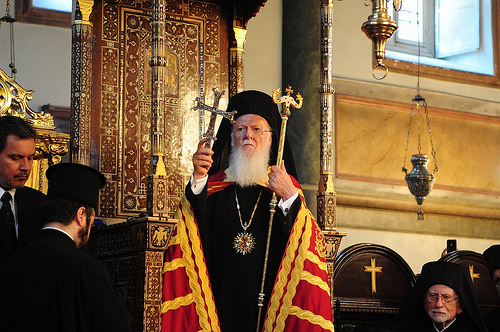 On June 10-12, 2012, the Name Day of His Holiness Patriarch Bartholomew of Constantinople was celebrated in Istanbul. A delegation of the Russian Orthodox Church took part in the celebration with the blessing of His Holiness Patriarch Kirill. The delegation was led by Bishop Savva of Voskresensk, a vicar of the Moscow diocese and abbot of the Novospassky monastery. He was accompanied by deacon Feodor Shulga, a staff member of the DECR secretariat for inter-Orthodox relations, and nun Nina (Pikova). Upon their arrival in Istanbul on 10 June 2012, members of delegation prayed at Great Vespers in monastery of the Life-Giving Fount of the Theotokos in Valukli, where the burial-vault of the Patriarchs of Constantinople is located. On June 11, the Divine Liturgy was celebrated at the Patriarchal Cathedral of St. George. His Beatitude Archbishop Ieronymos of Athens and All Greece and hierarchs and clergymen of the Church of Greece were among those attending the service. Metropolitan Konstantinos of Derkoi congratulated the Primate of the Church of Constantinople on behalf of clergy and laity. Bishop Savva of Voskresensk read out greetings from His Holiness Patriarch Kirill of Moscow and All Russia and presented His Holiness Patriarch Bartholomew with an inscribed panagia and a staff. His Beatitude Archbishop Ieronymos congratulated His Holiness Patriarch Bartholomew on behalf of the Church of Greece. His Holiness Patriarch Bartholomew thanked the Primate of the Russian Orthodox Church for greetings and presents, underscored the firmness of spiritual unity between the Churches of Constantinople and Russia, and asked to convey fraternal greetings and best wishes to Patriarch Kirill. All the guests were invited to festive repast. The delegation of the Russian Orthodox Church visited churches and monasteries of the Church of Constantinople and venerated her shrines.